«Le jazzman espagnol… un improvisateur de aute volée» [Jazz Magazine]; “Sound of surprise” [All About Jazz New York]; “Spanish jazz guitarist Ximo Tebar, it’s all magical, sophisticated and surprising” [JazzTimes Magazine]. Ximo Tébar is “Marca España” [Spanish Brand], a tasty fusion influenced by the classics, art of methodical virtuosity and daring jazzistic innovation. 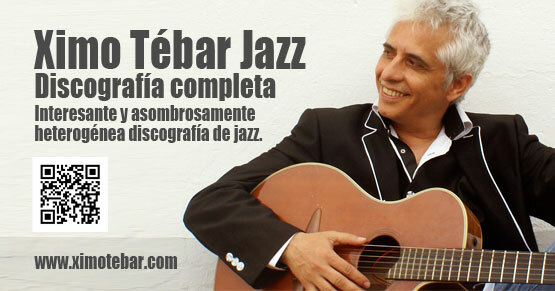 More than three decades ago, jazz guitarist, composer and producer Ximo Tebar began to promote his own projects fusing jazz with Mediterranean music. The result of his extraordinary research work on the fusion of Mediterranean music with jazz has led him to be recognized as creator of “Son Mediterráneo”, a jazzy sound with Flamenco-Mediterranean flavor and fragrance. “Jazz with a sea flavor”. Ximo is a connoisseur of jazz tradition and way of playing the guitar and has been endorsed publicly by prominent jazz masters as Benny Golson and George Benson. 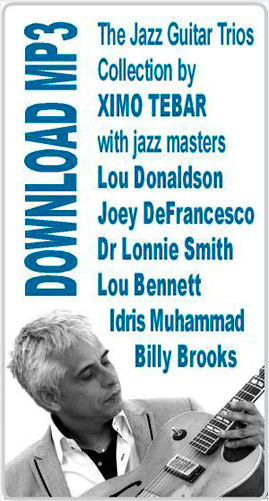 He has never stopped playing with jazz giants (Johnny Griffin, Benny Golson, Lou Donaldson, Joey DeFrancesco, Dr. Lonnie Smith, Joe Lovano, Arturo O’Farrill, Tom Harrel, Dave Schnitter, Idris Muhammad…). The great jazz organist Lou Bennett presented him in France as a “new guitar talent”, George Benson defined his style as a new voice of the guitar, Benny Golson said about him “He’s astounding”, and the most prestigious jazz magazines worldwide highlight it as: «Le jazzman espagnol… un improvisateur de aute volée» [Jazz Magazine]; “Sound of surprise” [All About Jazz New York]; “Spanish jazz guitarist Ximo Tebar, it’s all magical, sophisticated and surprising” [JazzTimes Magazine]. His extensive discography (17 albums as a leader), the numerous awards he has received (4 times national award by Ministry of Culture 1989-90. Two “Dexter Gordon’s Award” by RTVE “Jazz Entre Amigos” 1991. IAJE New York Education Academy JAZZ AWARD 2007, etc. .), the excellent reviews it has received, and especially the modernity and eclecticism of his music has led him to occupy a special place in the world of contemporary jazz.